Oct. 9, 2018, 10:24 a.m.
By Nicholas Quah Oct. 9, 2018, 10:24 a.m. Welcome to Hot Pod, a newsletter about podcasts. This is issue 180, published October 9, 2018. Have the Apple podcast charts felt weirder lately? Here’s a familiar scene: I’m trying to pass the time, so I pull up the Apple podcast charts to see what the youths are up to. (Ha.) This was my Sunday afternoon, and by that point, I hadn’t looked at the charts in a good few weeks. Part of this has to do with the way I learn about new projects these days: press releases, emails, text messages, phone calls, even a postcard once. But it mostly has to do with the fact that I haven’t found the Apple Podcast charts particularly useful in quite some time. Not for my purposes, anyway. With these charts, all I see is: “Doubt, doubt, trust (? ), doubt, doubt, Serial.” To my eyes, which hadn’t looked at the Apple podcast platform in a good while, the charts felt distinctly…broken. But then I thought back to earlier times when I skimmed the charts more often, perhaps every few hours, to see what was trending. What if the charts were always like this, and I just needed some time to readjust? So I did what I always do: I tweeted. Is it just me, or has the Apple Podcast charts felt more unhelpful than usual? Turns out, maybe the charts were acting crazier. My DMs lit up and the complaints poured in. Most messages were sent in private, couched in an apparent unwillingness to publicly express displeasure about Apple Podcasts — perhaps because getting promoted on the platform’s editorial page remains a manual process. But there were certainly other podcast folk independently raising the question in the open themselves. I'm sure I'm late to this question, but what in the name of Pete is up with the iTunes podcast chart? WTF is going on with the @ApplePodcasts charts? This gaming the charts nonsense has gotten a little out of hand. Several people expressed suspicions of a dramatic increase in chart manipulation campaigns. They were talking about those scams in which unscrupulous characters use or pay (via marketplaces like Fiverr) for automated scripts that rapidly trigger Apple Podcast platform interactions in order to artificially vault their shows up the charts. (See this and this by Discover Pods’ Kevin Goldberg, or this, for more details.) You can probably guess what’s a suspicious show, and what isn’t, by cross-referencing related data points like “number of episodes in the top episodes list,” as Chartable’s Dave Zohrob did here. Given the increased attention and stakes currently enjoyed by the podcast industry these days, there have never been greater incentives to engage in these efforts. Or at the very least, as Court Junkie’s Iman Jalali pointed out, there are actual human beings who wish to say things like “I have the No. 1 business podcast and No. 2 podcast overall on iTunes” at random conferences. “It’s Google search engine manipulation of 10-plus years ago happening all over again within iTunes,” Jalali said. This is combined with a vibrant cluster of frustration I heard around large drops in chart placement that seemed to be inconsistent with download behavior. Granted, I was also reminded that these drops (or mass chart reshuffles) happen periodically — it’s almost as if the charts “resets” itself every once in a while. But it feels like it’s happening more lately, some said. I also heard associated complaints of disappearing ratings and reviews. The most prominent of these, perhaps, came from Radiotopia’s 99% Invisible. Host Roman Mars tells me that somewhere between 500 to 700 of the show’s ratings appears to have disappeared over the past few weeks. As a reminder, Apple has signaled that ratings and reviews are important drivers of chart placement. That’s why you hear those appeals for reviews at the end of so many podcast episodes; it’s deployed in the belief that such ratings can help the show get discovered on Apple Podcasts. If the durability of those ratings is compromised, or if the relationship between reviews and the ranker is in question, or if the chart rankings more generally are ultimately meaningless, then the logic of integrating those appeals don’t actually end up holding much water. At this point, you could argue: So what? These issues aren’t exactly new. And you’d be correct. I saw “chart resets” many times back when I still checked them every few hours. Disappearing reviews aren’t unheard of, though they seem to be fairly uncommon. And finally, chart manipulation scams were around back when I started listening to podcasts in 2008. Scams, after all, are a natural byproduct of platforms and human systems. If something can be gamed, it will be gamed. By this morning, the charts seemed to have worked itself back out. But the weekend’s pronounced chaos at the top of the charts left many podcast folks wondering: Have the frequencies of these three issues — the chart resets, the ratings disappearances, the scams, but particularly the scams — greatly increased? And furthermore: Are all three issues increasingly interrelated? Sure seems like it. I’ve reached out to Apple for comment or insight on the matter, and I’m still waiting to hear back. You’ll know when I do. Let’s do some more counter-arguments: Who cares? Do people still look at the Apple podcast charts? Do the charts still matter? And don’t we all know that the charts are weird and kind of broken anyway? I’ll confess: for the longest time, I’ve never thought these issues to be significant problems per se, because I’ve generally held a low estimation of the Apple podcast charts’ reliability and took it as a given that the industry would recognize, understand, and work around that. One producer voiced an opinion that summed up my position pretty well: “Sincerely, I’ve operated thinking [the charts] were all garbage and that that was the industry consensus. Are substantial decisions actually made based on them?” To put it another way: Forget it, Jake. It’s Chinatown. However, there’s an inequity at play. An Apple podcast chart that doesn’t work the way it should might have limited consequences for bigger shows and publishers — which already have the audience base and budgets to diversify their marketing efforts — but it disproportionately impacts smaller or newer teams looking to authentically access the top layer of the charts, where they can possibly be spotted by the demographic most likely to try them out. Even if the actual number of people checking out the charts is generally low, it’s still a meaningful number to that class of show. Are substantial decisions actually made based on the charts? Probably not, as far as major podcast publishers, advertisers, and various business folk are concerned. After all, they are already naturalized, informed citizens of the industry. But the ones who do make decisions based on them are the ones the industry needs: those dipping their toes into podcasting waters for the first time. Listeners, yes, but also new advertisers, investors, talent, and so on. Perhaps even unfamiliar reporters, the ones who are more inclined to give attention when they hear the word “Top 10 on iTunes,” as Joseph Fink points out, and the ones who use the word “chart-topping” when writing about a podcast when that concept, in fact, means very little. As my dad would say (shouts to him), a bad first impression is money left on the table. What does it mean when the top of the Apple podcast charts, one of the first touch-points for many newcomers, features more scams than authentic entries? What signal of values does the chart project to those experiencing their first glimpse of the wider podcast universe? There are also broader technical implications of an unreliable Apple podcast chart system. As Flash Forward’s Rose Eveleth points out, there’s a possibility that the effectiveness of the platform’s “You might also like” discovery feature might be compromised by errant chart behavior. And a good number of third-party podcast apps rely on Apple podcast listings to populate their catalog and power their own discovery features. (We saw a version of this dependency flare up during the Alex Jones de-listing episode.) I say “possibility” because, well, we simply don’t know how the Apple podcast platform works. All previous scholarship on the matter, including my own, is purely speculative. It’s a black box, it changes when it wants to, and it almost never signals why. And then there was the weird bug that happened last week. 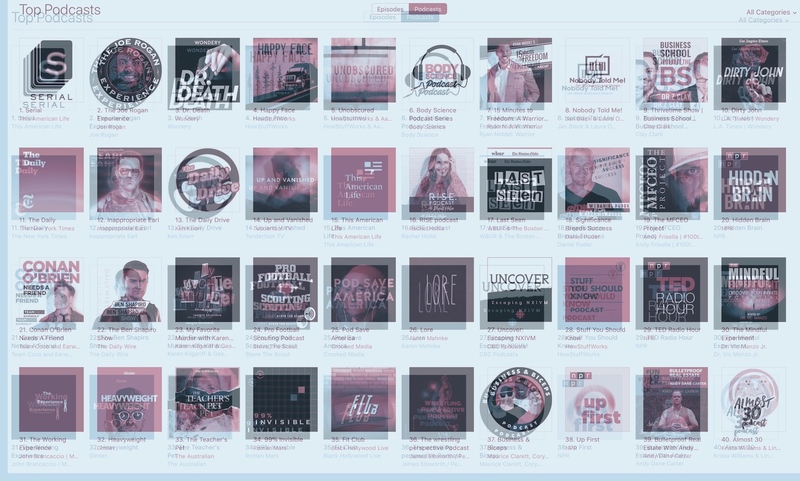 On Thursday morning, U.S.-based podcast publishers woke up to find that entire episode listings went missing for certain shows, including heavyweights like The Daily, My Favorite Murder, and Serial. The common denominator appeared to be podcasts that had published new episodes that day, though it should be noted that not all such shows were affected. Apple fixed the bug later that day, but the experience left many publishers feeling incredibly unsettled and powerless. Which brings us to another major question: What does it mean when creators invest a good deal of resources — time, talent, budgets, blood, sweat, tears, hopes, dreams — into a crucial marketing, discovery, and validation channel that is ultimately opaque and unpredictable? Let me check myself here. Would that it were so simple for me to baldly state that none of this should stand, that it’s ridiculous for the charts to be this bonkers, that Apple should do better. The reality is that managing something as complex as the Apple podcast platform is very hard. And the further reality is that podcasting remains a minor concern for Apple. Their historical status as a benevolent supporter of podcasting’s growth and open publishing values can be interpreted as…well, somewhat unexpected. Given these two realities, I don’t feel particularly legitimate pressing on the question of whether Apple Podcasts has a responsibility to provide its constituency with systems that are more reliable. With perspective, I’m just happy to be here. Hot on their heels. Last week, Spotify announced it was finally opening up its podcast section so that any publisher could submit their shows for inclusion into the streaming service. Previously, Spotify applied a more closed approach, practicing greater selectivity over what publishers it distributes. How will Spotify juggle its role as podcast aggregator and original podcast producer? We shall see. Also last week: Google Podcasts announced a partnership with PRX to launch something called the Google Podcasts Creator Program, which hopes to help “remove barriers to podcasting, increase the diversity of voices in the industry, and to make sure content is available for all audiences.” The heart of the program is a global accelerator not unlike PRX’s Project Catapult. Hold that thought for a second. This new program seems to be the continuation of some sort of charm offensive by Google Podcasts. Last month, Zack Reneau-Wedeen, Google Podcasts’ head honcho, appeared at PRPD — a big public radio conference for station program directors — to talk about how the search giant’s capacities with data, artificial intelligence, and machine learning can lead to “greater impact for local podcasters.” I recommend checking out the video of the conversation, but only if you have an hour to spare. I’ll write up my thoughts on that presentation at a later date, but what interests me at this point is the target Google Podcast team appear to be going after: previously underserved smaller shows. They win with bulk. Okay, back to the Creator Program story. My colleague Caroline Crampton conducted a great interview with PRX CEO Kerri Hoffman and Google Podcast head honcho Zack Reneau-Wedeen at the Third Coast Festival over the weekend, with you can find in this breakout post. Here’s an excerpt. Hot Pod: Why focus on training rather than funding? Kerri Hoffman: The training fills the skills gap that’s preventing podcasting from ever being diverse. We have to fill that. PRX is a non-profit organisation: we’re not trying to look for hits, we’re trying to grow the ecosystem, and that means whenever we train people, it’s good for everybody whether those people go and get jobs at another podcast company. It’s good for Apple, it’s good for Google, so that’s kind of why. Hot Pod: So, Google has a lot of money. Why the decision to focus on training like this, rather than giving out grants directly to creators? Zack Reneau-Wedeen: The number one thing I would say is that: we really want to form a model that can scale. So that’s why the empower[ment] piece is so important. The showcase and education pieces are areas where we think Google can do a great job, because we have reach. You know, we don’t just want the stories that come out of this to be the end of it. We want people to be inspired around the world, people to be educated on how to make podcasts. That’s why we decided to team up with PRX who will lead the program and execute the program. When it comes to the editorial side of things they have full control and working with an independent advisory committee, they’re selecting it right now, so we just wanted to make sure that’s something we can lean on an expert like PRX, where our expertise is more on the technological side, and getting the word out and helping educate people side. Hot Pod: How much of this will rely on unpaid labour, from people giving up their time to participate and be mentors? Hoffman: Not exactly. We will pay trainers — people who are volunteering to mentor — and we’re also giving participants a stipend so they can take the time out of their lives to participate. That’s a very important ingredient. We can’t ask people to take 20 weeks out of their lives to make a podcast unless we’re willing to offset some of their costs. This can’t be done on favours. It has to be done with intent. The reason why it’s a 20 week training program and not a week long program is because it takes a while to get good, and when you have a training program that long with a lot of mentors, you also create another side objective if creating a professional network for everyone who is participating. When we did this in public radio, the bonds that get created through these things are really strong, and they look out for each other and they solve problems together. Wondery’s Dr. Death is following in Dirty John’s intellectual property footsteps. Universal Cable Productions is developing a TV adaptation of the six-part series, according to Deadline. Podcast ouroboros: Marvel is adapting Wolverine: The Long Night into a comic book. When you butcher a deer, leave no wasted parts. The TV adaptation of Two-Up Productions’ Limetown is heading to Facebook Watch, and it will star Jessica Biel, according to The Hollywood Reporter. So, uh, seriously though: Anybody know Facebook Watch’s viewership numbers? Opinions, opinions. Prominent, storied, and consistently controversial, The New York Times’ Opinion section often feels like a news organization that’s distinct unto itself. It is also uniquely powerful within the Times. Tyson Evans, NYT Opinion’s senior editor for strategy and product, tells me that the section is often the most-read section among all the journalism the Times publishes each day. It is only natural, then, that such an audience engine should have a podcast of its own — and soon, it will. Called The Argument, the weekly Opinion podcast will feature columnists David Leonhardt, Michelle Goldberg, and Ross Douthat (plus special guests) guiding listeners through the news cycle with their commentary and analysis. In other words, it is yet another entry in the exceptionally saturated genre of roundtable political podcasts, which includes the Slate Political Gabfest, Vox’s The Weeds, Pod Save America, and even Chapo Trap House. The show will also routinely draw from the section’s deep bench of columnists, all of whom will presumably bring their followings into the listener mix. Seems like a useful back-pocket move to have from an audience development perspective. It’s worth noting that the Times’ in-house audio team won’t be handling the show’s day-to-day production. Instead, they’ve farmed out duties to to Transmitter Media, the boutique podcast studio founded by former Midroll Media executive producer Gretta Cohn. The specific producers on task are Alex Laughlin, who was part of BuzzFeed’s recently laid-off podcast team, and freelancer Ryan Kailath. The Times’ audio team is said to remain involved in shaping the show’s identity, assisting with research, and developing an audience strategy. So, here’s my thing about this story: I think it’s a no-brainer for the Opinion section to put out some audio product. I have no special insight into the data on this, but I’ve long suspected that there are chunks of the Times readership who primarily get their news through the columns of Frank Bruni, Gail Collins, and Paul Krugman. (In Krugman’s case, it’s news and music recommendations.) I’m thinking, specifically, about my septuagenarian father-in-law in the Mountain West who, while quirky in many ways, is also more representative of a big chunk of the “average American news consumer” that’s demographically separate from myself or my murderous millennial cohort that lives and dies by the push notification. I also think that given the Opinion section’s…let’s-call-it-unique place in media and the wider culture, there is a ton of room to build a show that’s more formally adventurous than a basic roundtable show. Maybe The Argument will be a really good conversational podcast; we’ll find out soon enough. It’ll probably do good business. But the fact of the matter is: These are not normal times, no sirree. These are emotional, difficult, harrowing, “why the hell are there white nationalists” times. And as much as you need the right journalists to step up to the plate, you also need the right formats to step up as well. The Argument will roll out its first episode this Thursday. POSTED Oct. 9, 2018, 10:24 a.m.
Quah, Nicholas. "What is up with Apple’s screwy (and seemingly scammy) podcast charts?." Nieman Journalism Lab. Nieman Foundation for Journalism at Harvard, 9 Oct. 2018. Web. 20 Apr. 2019. Quah, Nicholas. "What is up with Apple’s screwy (and seemingly scammy) podcast charts?." Nieman Journalism Lab. Last modified October 9, 2018. Accessed April 20, 2019. https://www.niemanlab.org/2018/10/what-is-up-with-apples-screwy-and-seemingly-scammy-podcast-charts/. 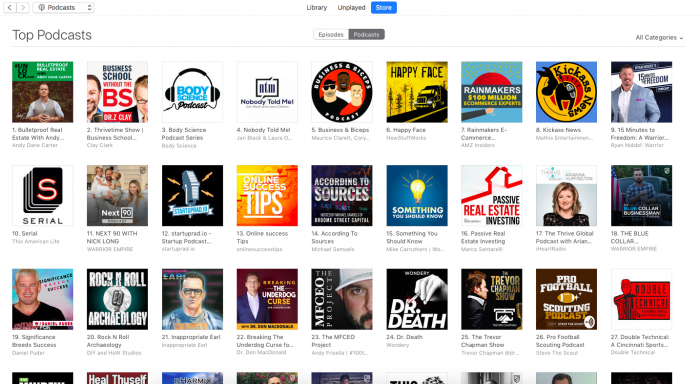 | title = What is up with Apple’s screwy (and seemingly scammy) podcast charts?